Michigan's Devin Gardner ranked second in the Big Ten in passing yards; Kansas State's Tyler Lockett has accumulated 1,146 receiving yards. In a tale of two returns, Kansas State and Michigan meet on Dec. 28 in the final Big 12-Big Ten incarnation of the Buffalo Wild Wings Bowl. For Kansas State, it’s a quick return, as the Wildcats came to the Valley of the Sun last season to meet Oregon in the Fiesta Bowl. Certainly, Kansas State would rather be playing in that bowl again, but after the graduation of Heisman Trophy finalist Collin Klein the Wildcats took a step backward this season. Conversely, Michigan returns to Arizona after a long layoff, playing in the state for the first time since the 1986 Fiesta Bowl, its only other appearance here. The Wolverines have won seven games this season, fewest of coach Brady Hoke’s three-year tenure and fewest since Rich Rodriguez’s final season in 2010. Last game: The Wildcats wrapped up the regular season with a 31-10 win over Kansas that gave Kansas State a fourth straight winning season. Scouting report: The season started on a sour note for Kansas State, as it followed up the program’s best season with a loss to FCS school North Dakota State. The Wildcats rebounded, though, thanks largely to a four-game winning streak mid season that included wins over West Virginia, Texas Tech and TCU. Despite Klein’s departure, Kansas State still had weapons on offense, including First Team All-Big 12 receiver Tyler Lockett and running back John Hubert, who helped Kansas State rank fourth in the conference in rushing. Even primary quarterback Jake Waters has had a solid year, ranking third in Big 12 passing and second in efficiency. But it was the Wildcats’ defense that impressed most. The unit ranks fourth in the Big 12 in scoring defense and total defense and third in pass defense. Defensive end Ryan Mueller, a Big 12 First Teamer, leads the conference in tackles for loss and is second in sacks. Last game: Michigan gave Ohio State all it could handle but lost 42-41 when it failed to convert a game-winning two-point conversion at the end of regulation. Scouting report: Michigan’s season began with promise, as the Wolverines opened 5-0 including its signature win over then No. 14 Notre Dame. They won just two more games the rest of the way, neither coming over a bowl eligible team. Still, Michigan ranks among the Big Ten’s top scoring offenses behind quarterback Devin Gardner, the conference’s second leading passer with 246.7 yards per game. Gardner has solid targets in senior Jeremy Gallon, the Big Ten’s second leading receiver, and tight end Devin Funchess, the conference’s Tight End of the Year. Michigan’s running game, though, ranked 11th out of 12 teams. The Michigan defense, however, has been more middling, ranking no higher than fifth in the Big Ten in the major defensive categories. — Kansas State has taken a two-headed approach to replacing Collin Klein at quarterback, using one man for each element — passing and running — Klein brought to the table. Waters has been the primary quarterback and handled the bulk of passing duties (2,198 yards, 15 touchdowns, nine interceptions, 59.2 percent completion) while Daniel Sams has gotten it done on the ground (784 rushing yards, 11 touchdowns). Snyder said he prefers to have one quarterback but that this was the team’s best option this season and both will play in the Buffalo Wild Wings Bowl. "I’ve never been a fan of have two guys at that position that play equally," Snyder said. "But both of them work diligently at it. Both of them are deserving of having the opportunity to play." — Michigan will play in a bowl for the 37th time in 39 seasons. The Wolverines are 16-20 in bowls over the past 38 seasons. This will be Michigan’s first December bowl game since 1995 and seventh all time. With a win, Hoke would hit the eight win-mark and avoid his first seven-loss season at Michigan. Each coach since Bo Schembechler took over in 1969 has had just one season of fewer than eight wins except Rich Rodriguez, who never won more than seven. Schembechler (1969-1989) only won fewer than eight games once, Gary Moeller(1990-94) never won fewer than eight and Lloyd Carr (1995-2007) fell below eight wins just once. 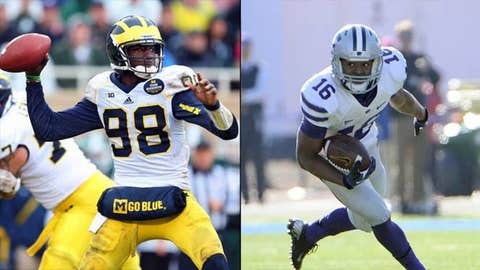 — This game will be the first time Michigan and Kansas State have played each other.